To ensure public protection, each jurisdiction requires candidates for registered nurse licensure to meet set requirements that include passing an examination that measures the competencies needed to perform safely and effectively as a newly licensed, entry-level registered nurse. Triennially, NCSBN conducts a practice analysis to analyze entry-level RN practice. Using the data collected from the practice analysis, the NCLEX Test Plan is developed, which guides the selection of content and behaviors to be tested during NCLEX administration. 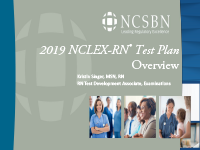 This webinar will provide an overview of the 2019 NCLEX-RN Test Plan, including new information effective with the test plan revision. Frequently Asked Questions related to the project. To ensure public protection, each jurisdiction requires candidates for practical nurse licensure to meet set requirements that include passing an examination that measures the competencies needed to perform safely and effectively as a newly licensed, entry-level practical nurse. NCSBN develops a licensure examination, the NCLEX-PN, which is used by jurisdictions to assist in making licensure decisions. 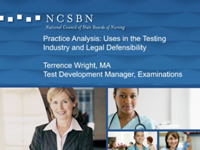 Triennially, NCSBN conducts the NCLEX-PN Practice Analysis to analyze entry-level PN practice. Using the data collected from the practice analysis, NCSBN develops the NCLEX Test Plan which guides the selection of content and behaviors to be tested during NCLEX administration. 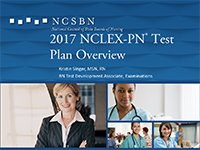 In April 2017, the new 2017 NCLEX-PN Test Plan will become effective. This webinar will provide an overview of the 2017 NCLEX-PN Test Plan, including new information effective with the test plan revision. To ensure public protection, each jurisdiction requires candidates for registered nurse licensure to meet set requirements that include passing an examination that measures the competencies needed to perform safely and effectively as a newly licensed, entry-level registered nurse. 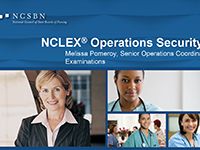 NCSBN develops a licensure examination, the NCLEX-RN, which is used by jurisdictions to assist in making licensure decisions. Triennially, NCSBN conducts the NCLEX-RN Practice Analysis to analyze entry-level RN practice. Using the data collected from the practice analysis, NCSBN develops the NCLEX Test Plan which guides the selection of content and behaviors to be tested during NCLEX administration. 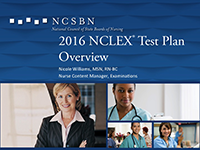 In April 2016, the new 2016 NCLEX-RN Test Plan will become effective. This webinar will provide an overview of the 2016 NCLEX-RN Test Plan, including new information effective with the test plan revision. The Item Writing and Item review Webinar will provide an overview of the Item development process. It explains the processes of item writing and item review used to ensure the validity, reliability and legal defensibility of the NCLEX exam. The session will also discuss and provide a direct link to valuable NCLEX resources, along with a connection to the next segment in the series. This rule is the most common for NCLEX candidates. The computer will stop giving items when it is 95% certain that your ability is clearly above or clearly below the passing standard. When your ability is very close to the passing standard, the computer continues to give you items until the maximum number of items is reached. At this point, the computer disregards the 95% confidence rule and decides whether you pass or fail by your final ability estimate. If your final ability estimate is above the passing standard, you pass. If your final ability is at or below the passing standard, you fail. The Dif and sensitivity Webinar will cover the Differential Item functioning (DIF) and Sensitivity Item Review processes. The webinar will describe the purpose of the processes and the procedures involved with reviewing items for DIF and Sensitivity issues. The session will also discuss and provide a direct link to valuable NCLEX resources, along with a connection to the next segment in the series. 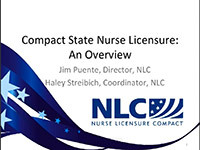 This webinar will provide an overview of the Nurse Licensure Compact and will focus on licensing. The use of Electronic Health Records (EHRs) has grown over the past few years and is now seen as an essential part of primary and acute patient care and case management. Boards of Nursing retain responsibility for public safety and need to be aware of current practices, policies and patient safety enhancements with the use of EHRs. For the best viewing experience, view video in full screen. 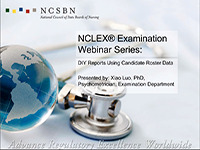 This NCLEX-RN Webinar for Canadian Nursing Educators provides an overview of the role of regulatory examinations, why the NCLEX was selected for Canadian RN entry to practice, an introduction to the elements of computerized adaptive testing and NCLEX development, as well as information on how students and educators can prepare for the NCLEX in 2015. Why all the buzz about NCSBN’s World Café meeting? In December of 2011, the NCSBN Nursing Education Committee hosted a World Café meeting as part of their work to make recommendations for the future of nursing program approval. This innovative meeting brought together regulators, educators and accreditors to shape the future of nursing education. The Webinar features the results of the World Café discussions and illustrates what contributed to its success. Next steps for nursing regulatory bodies (NRBs) in moving forward with nursing program approval initiatives are discussed, highlighting our new online toolkit that provides NRBs with resources and support for requiring national nursing accreditation. The NCSBN Leadership Succession Committee (LSC) host a Leadership Succession Call to recognize influential NCSBN Leaders to provide future, emerging, and current leaders of NCSBN with opportunities to enhance and develop leadership succession knowledge and skills. 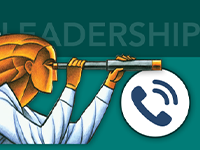 Listen in on the February 19, 2019 Leadership Succession Call. LSC member Tracy Rude, President, Washington State Nursing Care Quality Assurance Commission interviews Cathy Borris-Hale, Board Staff, District of Columbia Board of Nursing and Sue Petula, Board Staff, Pennsylvania State Board of Nursing. 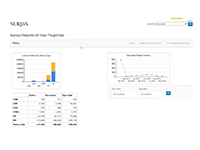 This webinar will show you how to run reports in the IntelliVUE 2.0 reporting platform (launched February 2017). NCSBN psychometric staff will demonstrate how to run Candidate Reports, Program Reports and Quarterly Reports and will highlight their differences. After this webinar, you will be able to run the reports that meet your needs and know how to automatically run and generate your subscribed reports, on a daily, weekly, monthly or quarterly basis. Listen in on the November 7, 2018 Leadership Succession Call: Kaci Bohn, LSC chair, interviews Kathy Thomas, Executive Director, Texas Board of Nursing and former NCSBN Board President. Overview of the accommodations process which will detail the online process, provide insight into NCSBN’s review, and highlight frequently asked questions. Learn about the logistics of item writing and review panels including various volunteer opportunities that you can pass along to potential volunteers. Topics include the application process, selection criteria, and an overview of what it is like to be a participant on a panel. 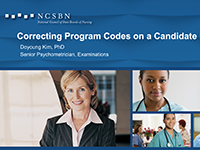 This webinar will educate participants on the basic principles of program code maintenance, provide information on the program code resources available to nursing regulatory bodies and clarify common program code questions. This webinar will provide information on how the candidate level change is processed. In addition, participants will be able to fill out the Candidate Level Change Request form and verify the change. The NCLEX is administered under strict supervision and security measures as a part of NCSBN’s mission to promote patient safety and public protection. This webinar will take a behind-the-scenes look at the security measures in place at the testing centers, case reporting via our new platform Service Direct and the Results Cancellation Process. At the end of this webinar, nursing regulatory body participants will be able to better understand candidate cases as well as their role in the Results Cancellation Process. 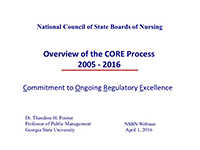 This Webinar gives an overview of NCSBN’s Commitment to Ongoing Regulatory Excellence (CORE) program. CORE allows nursing regulatory bodies to monitor, analyze and report comparative performance information. This Webinar provides NCSBN member’s advice on developing effective surveys. Participants will learn how to select the correct type of question in order to gather the information they want, learn how to avoid common mistakes in designing surveys and learn helpful tips for making their surveys more informative. Standard setting is a process used to determine a cut point on an ability continuum. Examinees scoring above the cut point are considered competent and able to practice safely and effectively. The NCSBN Board of Directors re-evaluates the passing standard every three years or when the test plan changes. This webinar provides a brief description of how the standard setting method (Modified Angoff) used by NCSBN works and information on how NCLEX standard setting is conducted using a small test example. 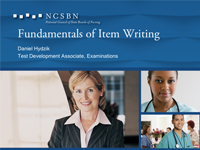 This webinar discusses the principles of item writing with a focus on writing NCLEX-style items. 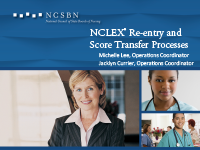 This is a two-part webinar: the re-entry of previously passing candidates and the NCLEX score transfer process for non-licensed candidates. Both of these processes require communication between nursing regulatory bodies (NRBs), Pearson VUE and NCSBN. This session should help answer questions that NRBs may have in regards to re-entry candidates and the NCLEX score transfer process. This webinar introduces a new, dynamic report (Education Program Pass Rate) that will be launched in January 2016 through Pearson VUE’S Business Intelligence platform. Here, our psychometric staff reviews existing reports and demonstrates how this new report will provide a better and easier way to get the information you need. After this webinar, you will be able to run the Education Program Pass Rate report for students who were educated in your jurisdiction and licensed in all jurisdictions—both first timers and repeaters. This report includes both an education program summary and individual student information. This webinar offers insight into the practice analysis and test plan development process used to create the NCLEX. The information discussed in this webinar can be used to assist nursing regulatory bodies with further understanding test content and purpose. This webinar demonstrates how to run a data query in Pearson VUE’s Business Intelligence (BI) platform and download the data for further analysis using Microsoft Excel’s pivot table function. After this webinar, you will be able to use this function to make customized reports specific to your operational needs. Join the NCSBN Exams ADA Team to learn more information about the details of the ADA process. In order to support the expansion of new nursing programs within existing jurisdictions as well as to accommodate the expansion of the NCLEX in Canada, NCSBN is lengthening the NCLEX Educational Program Codes from 5 to 10 characters. This webinar explains the change to the Program Codes and provides key dates. Members can use this information to communicate the change to the program codes to the programs within their jurisdiction. This NCLEX Webinar provides an overview of the NCLEX quarterly reports and education program summary, including a demonstration of the differences between reports, methods of report comparison and how to use the dynamic reports to fit specific needs. Visit the Quarterly Reports page for more information on the review process. Le webinaire Plan d’examen du NCLEX donne un aperçu du plan de l’examen NCLEX et de son contenu, en explique les différentes versions et montre l’utilité du document et comment l’utiliser. La séance présente également des ressources très utiles sur le NCLEX et des liens directs vers ces ressources, de même qu’un lien vers le segment suivant de la série. 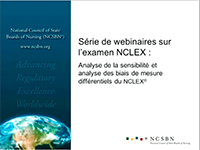 Le Conseil canadien des organismes de réglementation de la profession infirmière (CCORPI) et le National Council of State Boards of Nursing (NCSBN) ont le plaisir d’annoncer le webinaire sur l’examen NCLEX. Ce webinaire donnera un aperçu du rôle des examens de réglementation et des raisons qui ont motivé le choix du NCLEX pour l’examen d’admission à la profession infirmière au Canada, présentera les éléments d’un examen adaptatif informatisé et expliquera l’élaboration du NCLEX. Le webinaire fournira aussi de l’information sur la façon dont les étudiantes et les enseignantes peuvent se préparer à l’examen NCLEX prévu pour 2015.